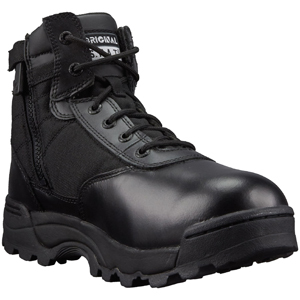 For law enforcement professionals looking for a top of the line, mid-height tactical boot, the Original SWAT Classic Men's 6in Hot Weather Side-Zip Tactical Boot 116401 delivers all around versatility and performance in any environment. A convenient side zipper enables easy entry and removal for those on the go. This lightweight tactical boot features 100% full grain leather and Cordura 1000 denier nylon upper for lightweight durability and comfort. A polishable leather toe keeps gives this boot a uniform appearance at all times. Original Footwear packs the most advanced footwear technology into its boots. A foam padded collar and tongue provides protection and increases ventilation and cooling. A custom-molded phylon EVA midsole gives lightweight comfort and excellent shock absorption while a steel shank provides superior support. A custom-molded thermoplastic heel counter and toe box is another footwear technology feature that makes Original SWAT footwear one of the most advanced tactical footwear companies on the market today.